Mario Gomez of VfL Wolfsburg could be a great asset as one of my three forwards. Have you set up your team yet? No?! Then what are you waiting for - get over to the Official Fantasy Manager page now! With six points per goal on offer for defenders, as well as an extra two for a clean sheet, I’m expecting my defence to score a hatful of points at both ends of the pitch this season. Marc Bartra has been billed as the new Mats Hummels’ at Borussia Dortmund. The former FC Barcelona man must be worth a fortune, then… What’s that? He only costs 11 million? Come on, now. This is too easy. FC Augsburg captain Paul Verhaegh netted all of his six penalties for Die Fuggerstädter last term and was part of a side that kept an impressive 11 clean sheets in the league, while 19-year-old Nico Elvedi started 15 Rückrunde games for Borussia Mönchengladbach last term. At just 7 million, Elvedi could prove a real bargain. Fabian Schär showcased his eye for goal with Switzerland at UEFA EURO 2016 this summer. I expect him to be a central figure in an ever-improving TSG 1899 Hoffenheim outfit this term. The inclusion of Herrmann, meanwhile, is a calculated gamble. The winger managed 11 goals and five assists for Gladbach in 2014/15 before an injury-ravaged campaign last term. Can Herrmann prove his fitness and form to Foals coach Andre Schubert? I believe he can - 11 million well spent, I think! Now then, I’m going to break the habit of a lifetime and heed the advice of my colleague Flo: Classed as a midfielder in the game, BVB youngster Felix Passlack impressed at right-back in the Supercup and looks set to start against 1. FSV Mainz 05. He’s worth 5 million - what are you waiting for?! On the bench, I have 1. FSV Mainz 05’s Pablo De Blasis and FC Schalke 04’s Austrian international Alessandro Schöpf. Argentine wideman De Blasis set up one of the goals in the Zerofivers’ shootout victory over SpVgg Unterhaching in the cup and I’m hoping he can carry that form into Matchday 1. Schöpf has yet to establish himself as a first-team regular at FC Schalke 04, but he did score Austria’s only goal at EURO 2016 and I wouldn’t be surprised if he gets a few off the bench for the Royal Blues this term. If he does, it won’t be long before he breaks into Markus Weinzierl’s starting XI. I can’t wait to see how many points these three are going to accumulate over the course of the season. I doubt even the great Count von Count can count that high! Robert Lewandowski, last season’s Bundesliga top scorer with 30 goals, picks himself. The Poland striker is, quite rightly, the most-chosen player in the game. He also started the season as my captain against SV Werder Bremen - kerching! 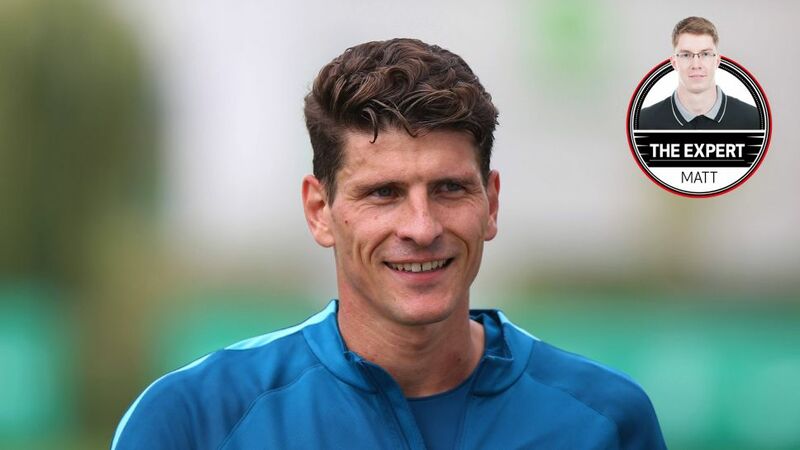 Recently described by Dieter Hecking as “the best German striker”, Mario Gomez may take a couple of weeks to adjust to life back in the Bundesliga, but having netted 26 Süper Lig goals in 33 appearances for Besiktas JK last season, he might just be the dead-eyed striker VfL Wolfsburg coach has been searching for. Reckon you can beat me? Let’s see, shall we? !